Gasps of surprise and then the clatter of small feet around us as we head for the terrace. In the moonlight, straight ahead, a lioness is crouched; alert, head down, drinking from the waterhole. Occasionally she looks up at us, her eyes glinting in the light of the torch. 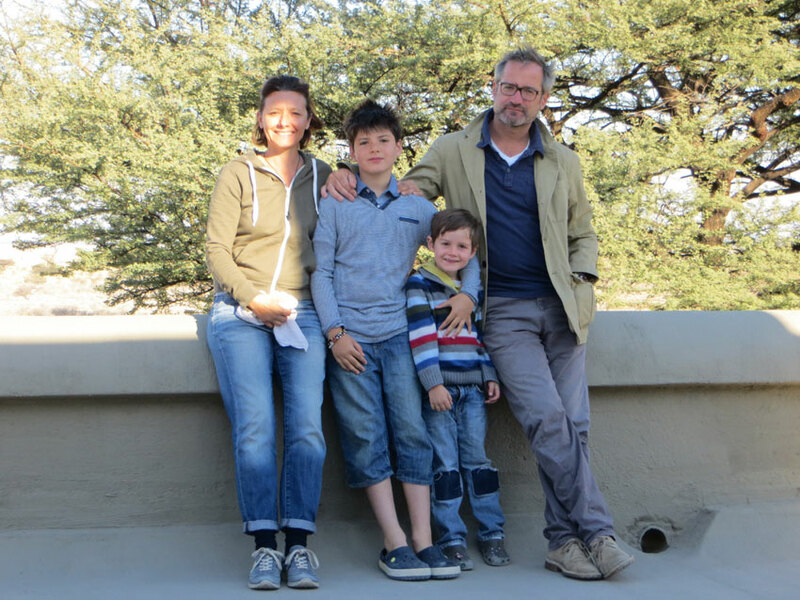 On the road in Namibia with kids. She roars. Well, more of a deep, growly grunt from her belly. Haroomph! Our six-year-old son Noe lets out a little squeal and squeezes my hand. There is more aggressive grunting and growling amid the odd chink of glass as we put our drinks down. 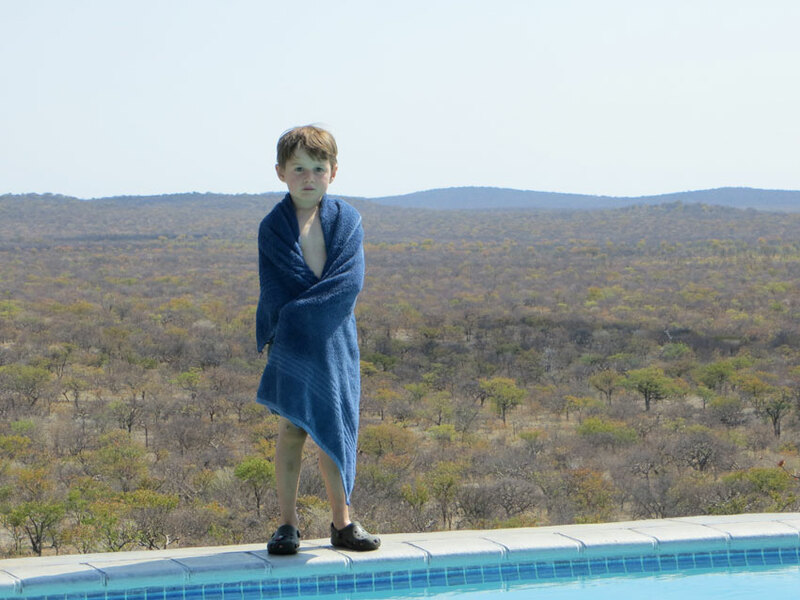 It was at Onguma Fort, a palatial Moroccan-style lodge on the edge of Etosha National Park, that our Namibian family holiday really took off. 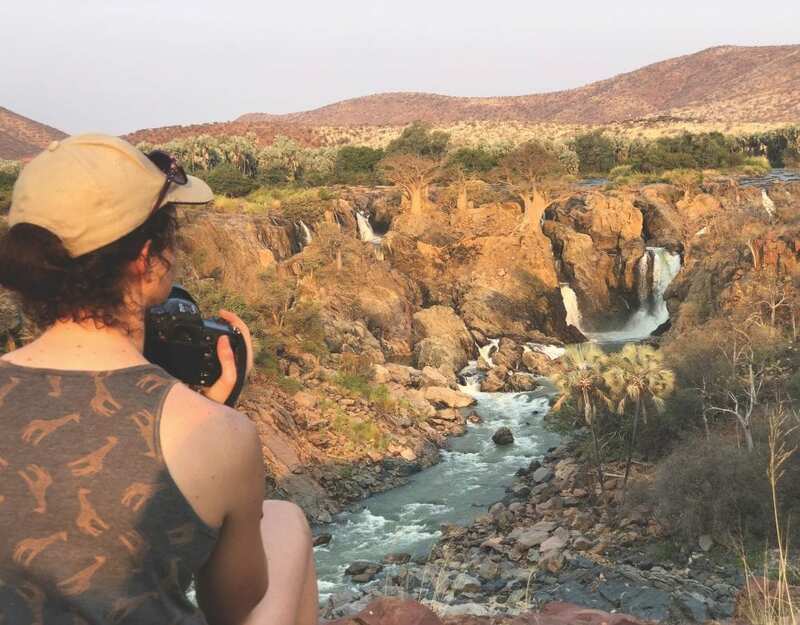 With a wonderfully low-key atmosphere, charming staff and beautifully designed chalets, our arrival after several hours on the road was a great way to start the Namibian experience. 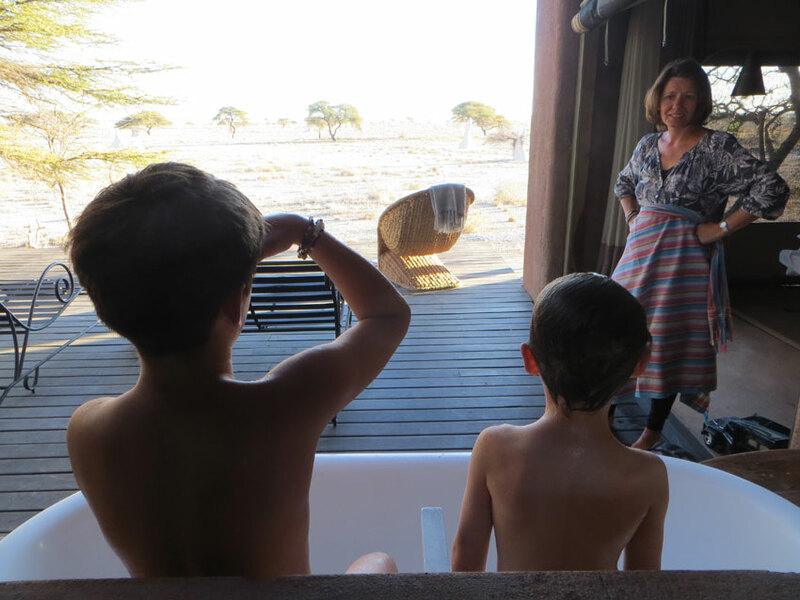 Sitting in our bath on the terrace, big enough for the whole family, we looked out across the dry August plain at springbok, zebra and warthog trotting past. We were by far the noisiest animals around. 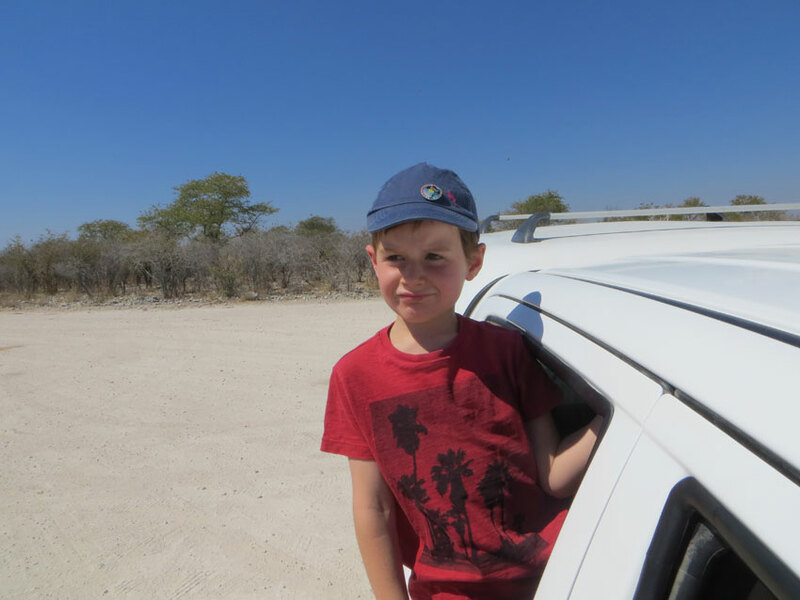 We had handled the 500-plus-kilometre drive up from Windhoek in good spirits. 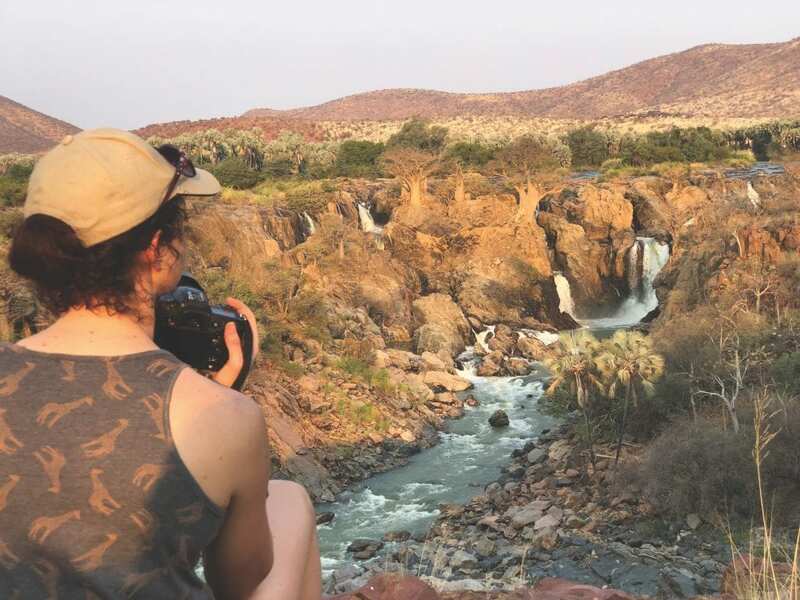 We had read one guidebook that said Namibia was not a country to travel around with children, ‘unless they are exceptionally patient’. Ours were not. The sheer size of the country (five times the size of the United Kingdom!) 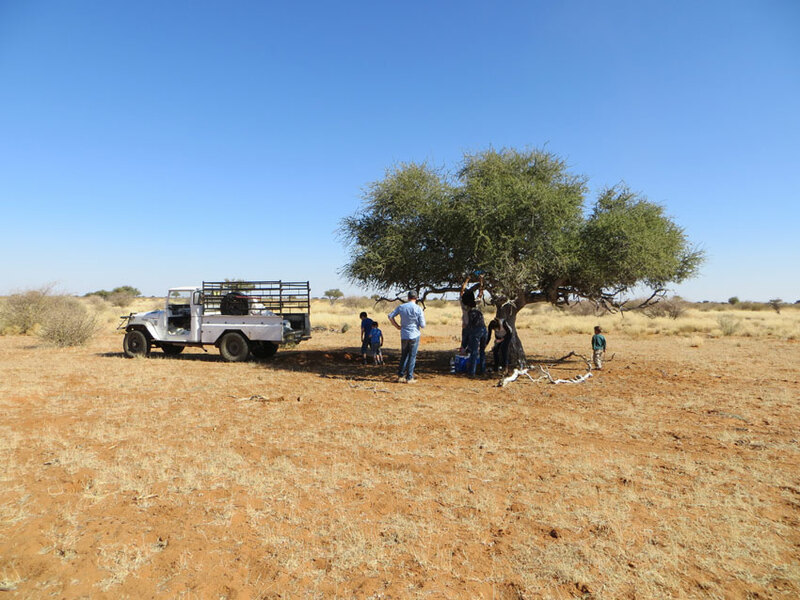 with a population of only 1.5 million and a notoriously tough landscape inevitably means travelling long distances and spending many hours in the car. Yet with some judicious planning, a picnic kit, binoculars and animal- and bird-spotting games, we managed to travel around for two weeks and have a great holiday. Visiting in August meant driving across a dry and dusty land, but also one that allowed us to see many animals and birds that might have remained hidden. 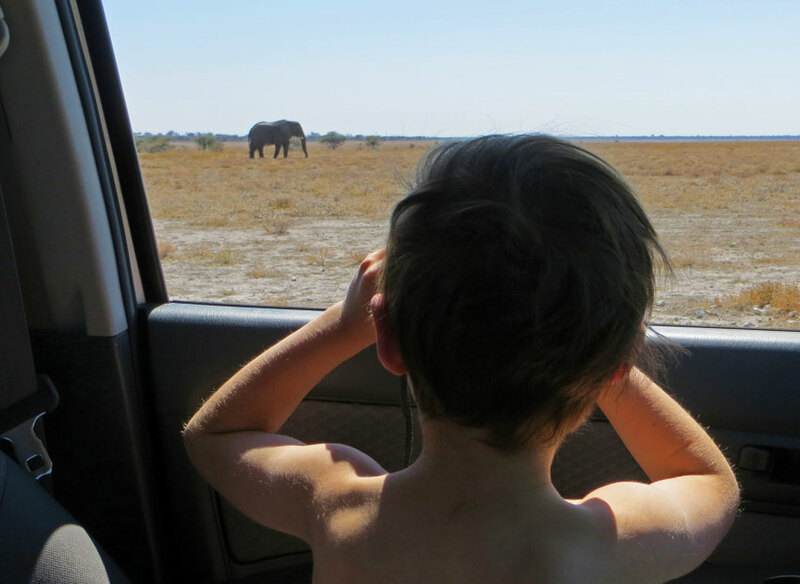 From spotted hyaena to rhino and giraffe, dik-dik to black-faced impala, gemsbok and elephants, there were animals and birds galore – not just in game reserves, but also along the side of the road. Seeing all the animals in the park, particularly mingling with over 50 elephants at one waterhole. Onguma Lodge for its laid-back and minimalist air, but also high levels of service. This included our own jeep early in the morning to see game, fortified by blankets, a knowledgeable driver and mugs of hot chocolate. Cool in the pool on the deck. 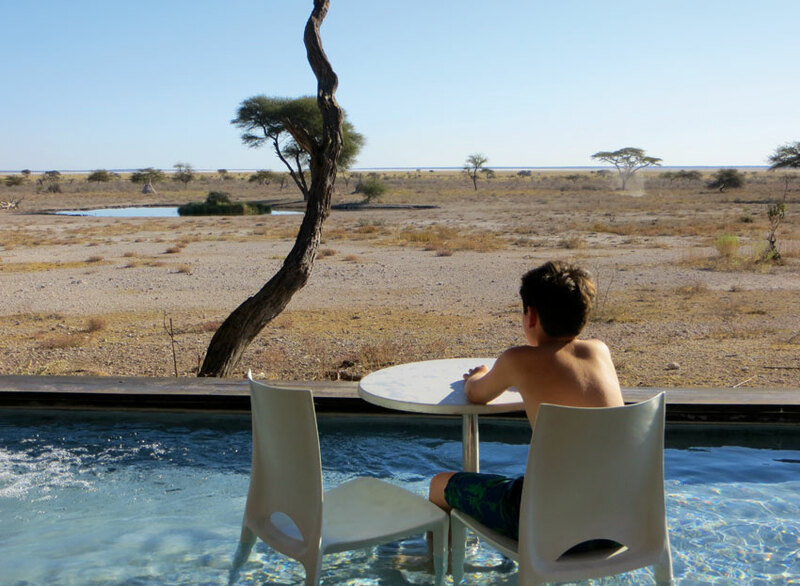 Etosha Lodge (a traditional family-friendly hotel with chalets perched on a koppie, affording great sweeping views), because it had a swimming pool on the edge of the hill with no one else in it and a dramatic backdrop, as well as a buffet where the kids could choose what to eat. Oh, yes – there were no lions or hyaenas around, which meant they could walk on their own between the chalet and the main building. We arrived in a rocky, reddish-brown landscape and a Tibetan-style building with a hint of Mad Max about it, perched on a little hill and dominating the landscape. The staff members were by far the most delightful team we met on our holiday. Very engaged, funny and also amazing singers (an after-dinner highlight). Our cottage had floor-to-ceiling windows that opened up, and at night we wheeled our beds outside. We went to sleep gazing up at the stars. 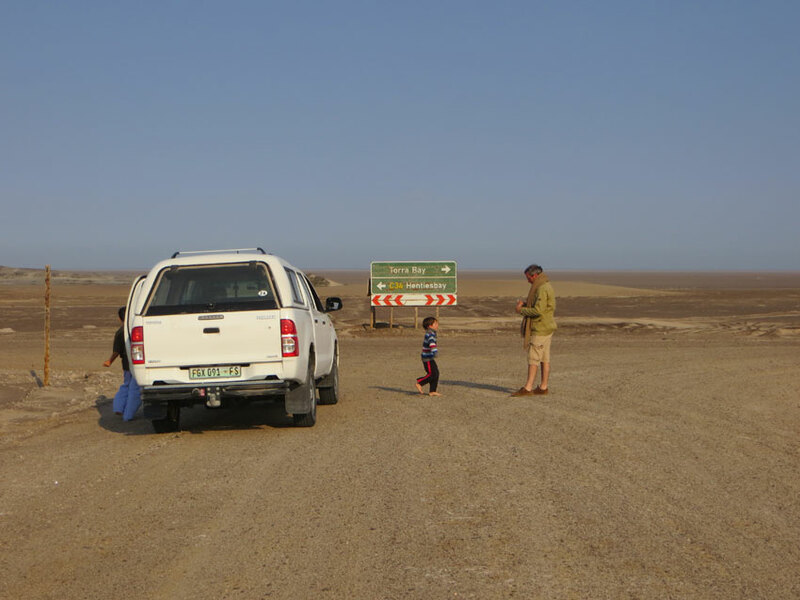 The next morning, after viewing some rock art, we headed west to the lunar landscape that is the Skeleton Coast, then turned south and drove down to Swakopmund. Boys, bikes and sand. Perfect. 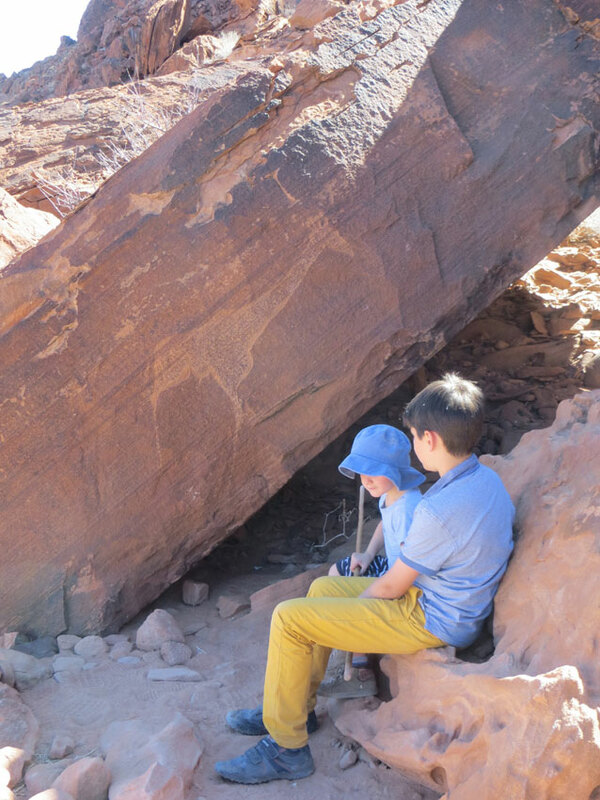 Yes – we knew we had to do it for our boys – and they loved it. 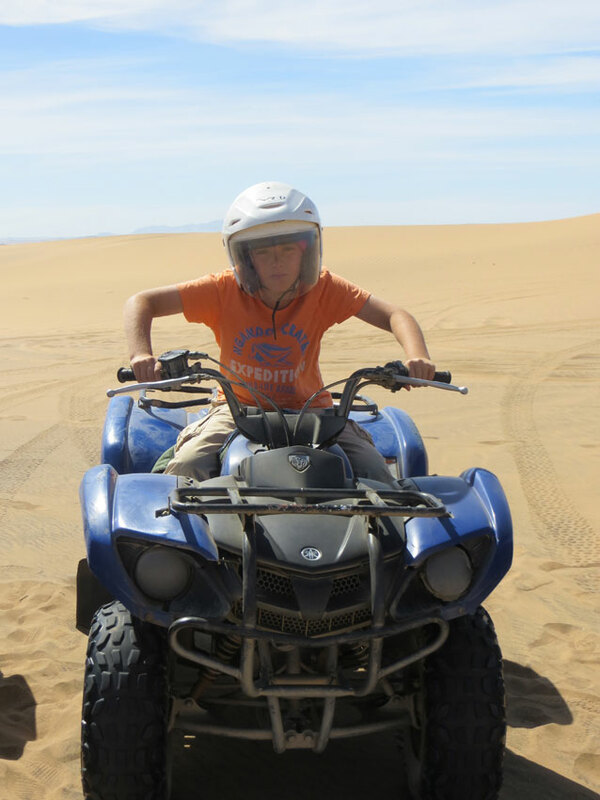 Driving around as a family on our own bikes with a guide over the dunes south of Swakopmund was their idea of heaven. Life on a farm in Namibia. Apparently this is a relatively new concept in Namibia but very common in Europe – we stayed on a real farm. Not a hunting farm but a cattle farm, with dogs and local hospitable family and horses and jeeps. The boys loved it, as they could casually walk around and there was always something going on. We came very close to leopard, lion, caracal and cheetah at N/a’an ku sê, a well-run refuge for the more dangerous animals that for various reasons could not be released back into the wild. With only one other family and a professional guide there, we were able to learn more about the big cats and see them from close by (behind a fence, as they are still dangerous). The boys gained a new respect for the power and ferocity of the lions in particular as they roared, scowled and pounced on their food. Although we had a great time, we did learn a few things the hard way, accompanied by a few tantrums. 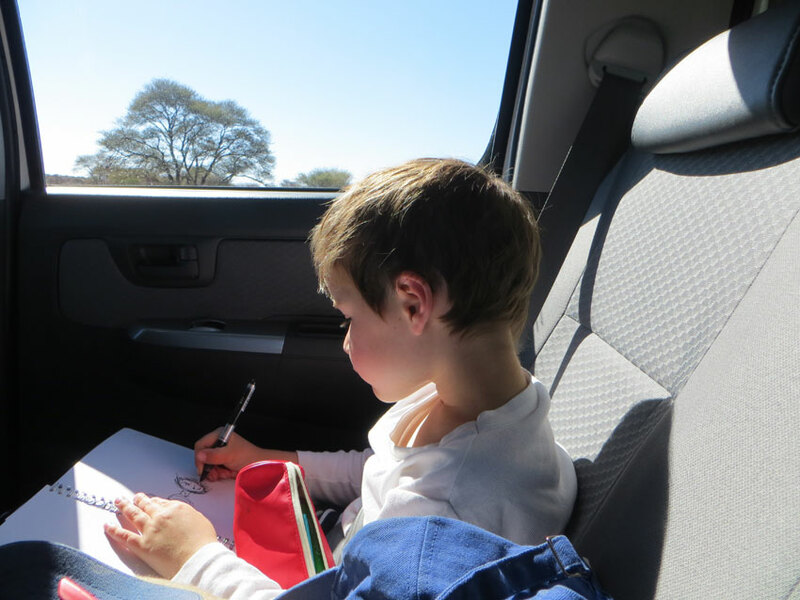 Here are our five rules for happy travelling with children in Namibia! It’s a huge country with large distances between most destinations. We found that the earlier we set off, the better the drive. Covering more ground while the children were more or less asleep was vastly preferable to a leisurely late start. As parents, we had to accept that the holiday lie-in was less important than covering ground before the kids got too bored. Take an alarm and be prepared to get up at sunrise! Copy the herbivore wildlife and go for grazing in the car. Food passed the time and, despite being heavier when we returned home, we felt it was a price worth paying for having no children-in-car mutiny. We stopped by the side of the road for picnics off the jeep tailgate, with the occasional baboon joining us at a distance, adding an African touch. We constructed ever-more elaborate competitions to spot different animals and birds. Having two boys, the competitive spirit kicked in and hundreds of kilometres were covered with us all scanning the horizon and bush for the animal we needed to win the game. The boys’ eyes lit up wherever there was a swimming pool. Being winter, there was no one in the pools except us northern Europeans, although the water was no colder than the Atlantic in summer. Hours of splashing around got rid of the in-car lack of movement and put everyone in a mood for supper. It also gave parents time to recover and refresh. I would recommend paying a tiny bit more for accommodation with a pool. 5. Admit when it’s too much! 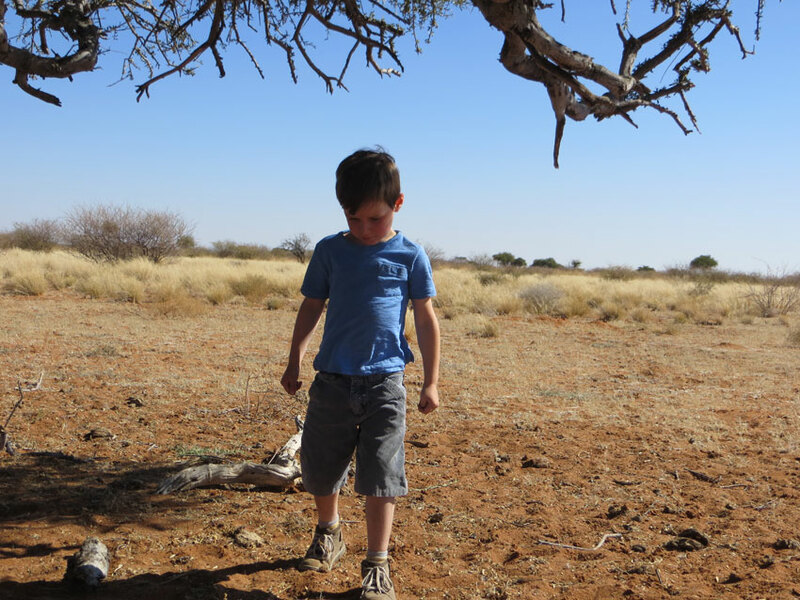 Taking on Namibia with two active boys … Milo and Noe. 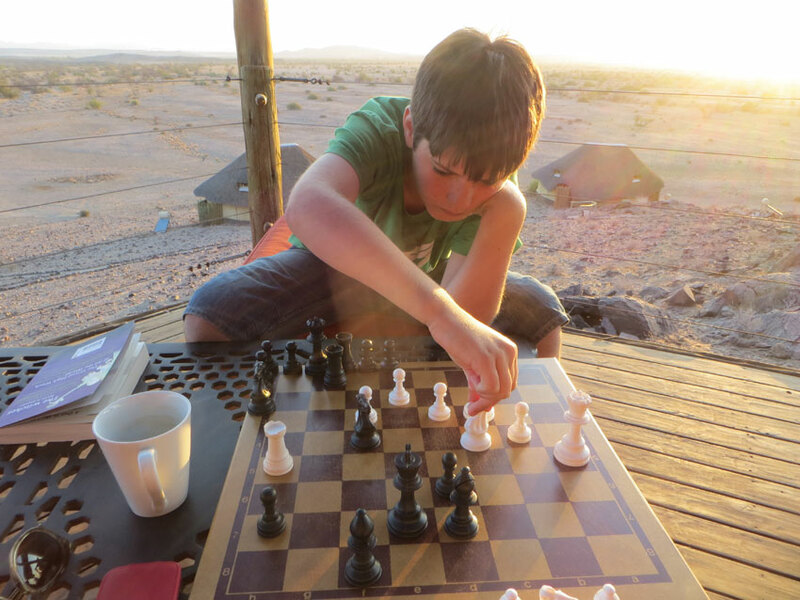 As the children snored in the back of the small light aircraft over the Namib Desert and Sossusvlei, I did realise that some things were simply beyond our children’s appreciation. The extraordinary rock and desert landscape – and where it meets the Atlantic – was not something they were interested in at all. In fact, they slept all the way through the breathtaking two-hour scenic flight. 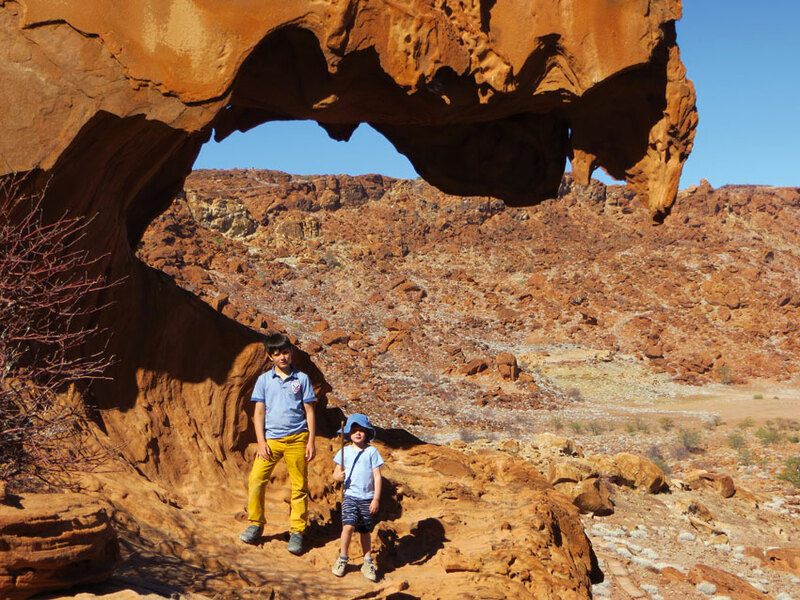 Despite this, we would recommend Namibia, even with kids! 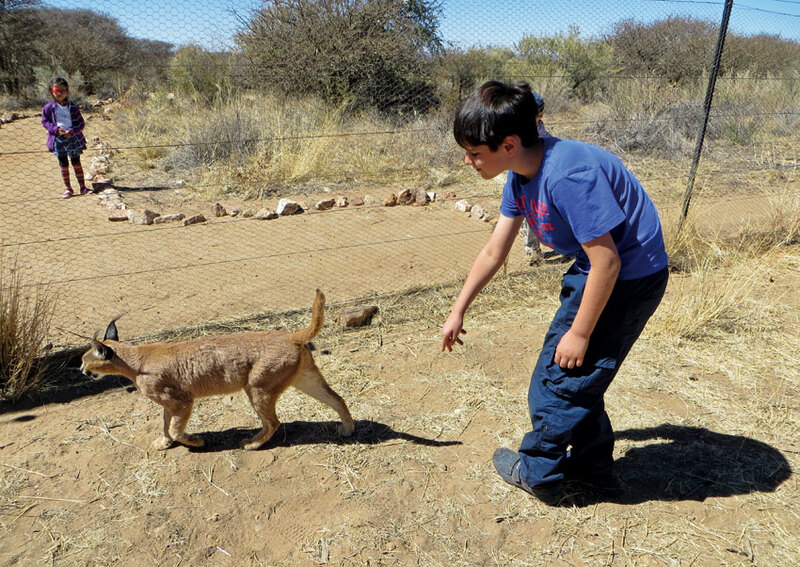 This story was originally published in the 2014 Autumn edition of Travel News Namibia.